This past week has been a busy one with trips and expeditions taking place daily. Here’s some updates on just a few. Despite being inconvenienced by injuries caused by a recent drunken bicycle accident, Nardiah (a Cardiff University Zoology student completeing her sandwich year here) braved a very muddy trip to Oyster Bed Lagoon with recent arrivals Tom and Claire yesterday. Nardiah has a few wounded fingers currently being supported by several lolly sticks and a bandage (she really didn’t want to go see the doctor so is DIYing it) which meant they couldn’t do any iguana catching. 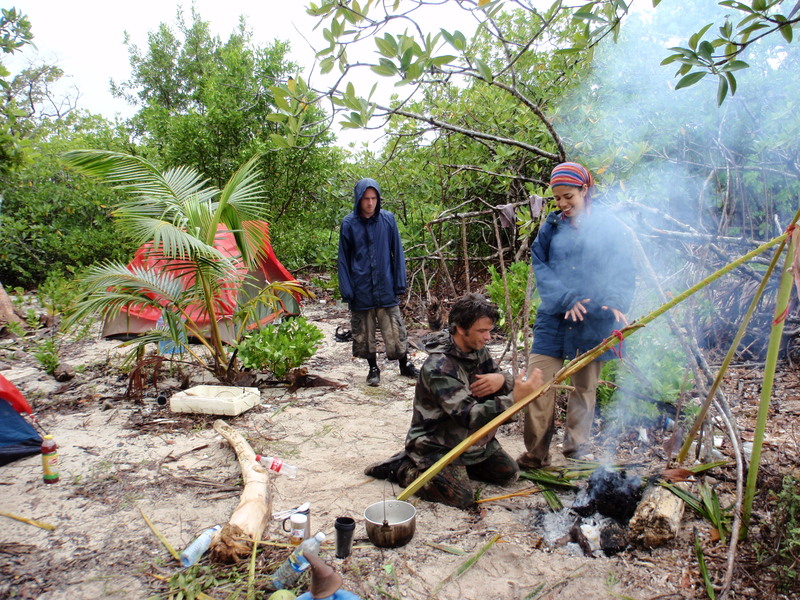 Instead, they surveyed the area for food availability by setting up ½ metre sq. transects and counting the crabs they saw over a given time period. Unfortunately the tide was a bit too high and very few were seen; the crabs were well hidden and probably frolicking around happily in their thousands below the murky water. The volunteers’ route took them worryingly close to a live wasp nest but they got by without a sting and ended the trip with a refreshing dip in the lagoon. Hopefully next time Nardiah will be armed with a full set of healthy fingers. A note to all – don’t cycle when under the influence of alcohol, it’s dangerous. Here is an account of another recent trip written by volunteer Marlene from Germany. At the end of March we travelled by boat to Turtle Harbour, which is on the northern coast of the island. We camped there for the whole weekend to explore. There are already some transects set out in the eastern part of Turtle Harbor. On this trip we wanted to find out if it would be viable to implement a set of transects in the western part as well. On our first tour we came through a lot of savanna which was not so helpful as it isn’t the iguanas natural habitat. But the second day proved more successful. 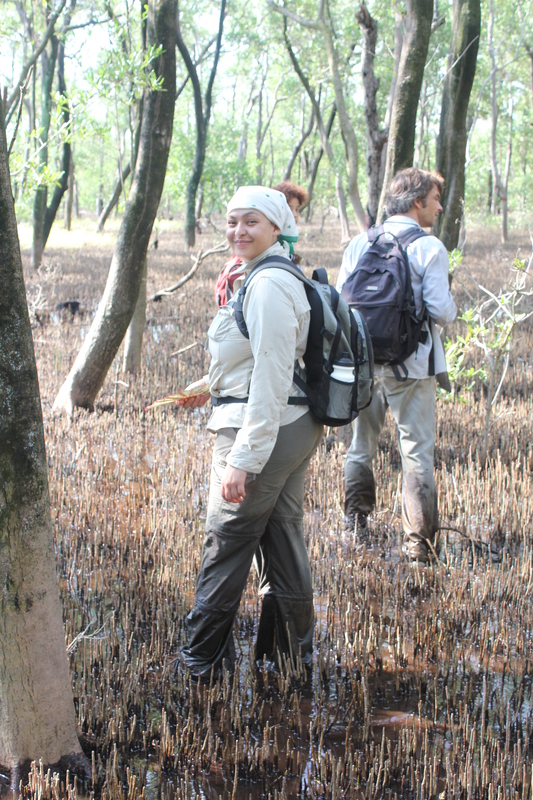 In the very western part of the area we found mangroves which made perfect iguana habitat. Some of the trees were a lot bigger than the mangroves we know from our other spotting sites. The soil was partly very sandy (fantastic for egg-laying) and there were several bits of dead mangroves and a swampy lake. In total we spotted around 26 iguanas, catching and tagging 12 of them. We even found one female who must recently laid her eggs as she was covered in sand and looked conspicuously skinny. The aim now is to make this part of Turtle Harbour one of our sites for the population studies. One weekend soon we will go out there again to start setting up 100 meter transects, and hopefully will see lots more iguanas! Last week the station’s director Andrea Martinez attended the annual meeting of Plan de Nacioñ y Visioñ de Pais (Plan of the Nation Vision of the Country) on the nearby island of Roatan. This committee is in charge of choosing a board of directors and treasurer which will decide how Honduras’ budget will be split between regions of the country. Lots of big important people such as members of NGOs (Non Governmental Organisations), leading community figures, and officers from the municipality departments are on the committee. The idea is that all regions get to have their say so that the budget is fairly spent. Andrea was the NGO representative for the 3 Bay Islands and Cayos Cochinos and her official position is Secretary to the Municipal Council for Development of Utila. Rather impressive! By creating such a committee, the government hopes to involve more people in how Honduras spends its money, but most importantly in a transparent way that hinders the corruption which is so rife here. If you’re a Spanish speaker more information can be found at www.seplan.gob.hn. 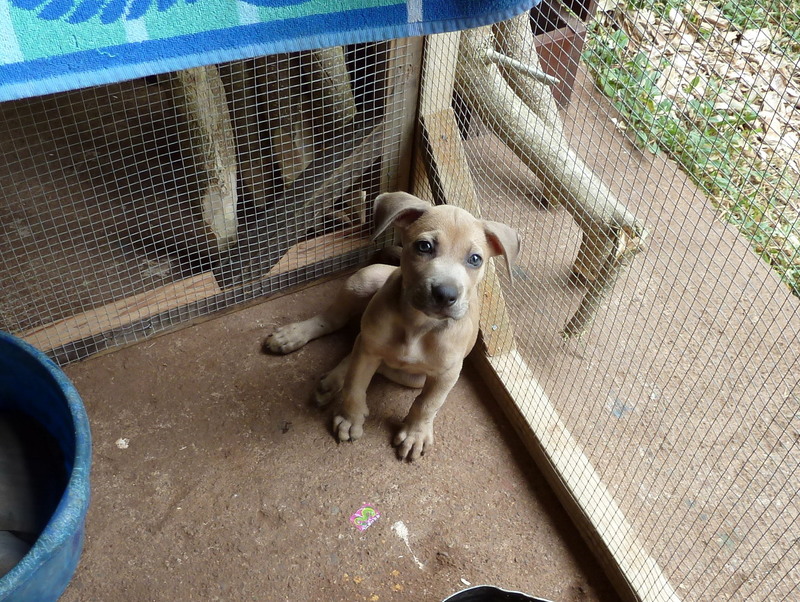 A nice one of Serena the puppy to end on, who is very happy in her new home and is growing chunkier by the day. She’s going to be a right bruiser. ~ by iguana123 on March 30, 2011.